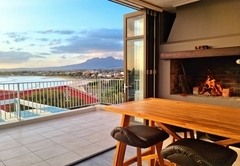 Die Braaihuis is a property providing self catering in Gordons Bay for up to 6 guests visiting the Cape Helderberg region. 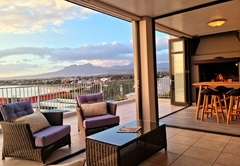 Die Braaihuis is a wonderful roomy home with three bedrooms, a great atmosphere and exceptional views. 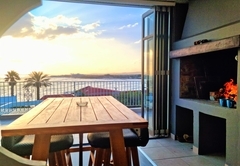 Named after its fantastic braai room, which is the best feature of the house with fold back doors that allow a totally outdoor ocean feel. 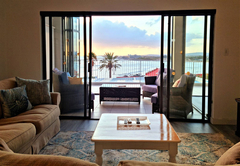 On colder windier days you can still sit snuggly with the doors shut and admire the wonderful view. 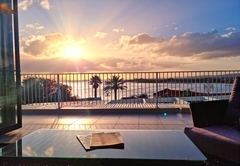 The house is a short walk from the shops and restaurants and has quick access to the main swimming beach and fabulous coastal walks. 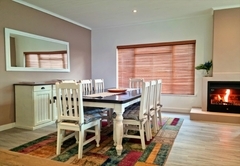 Die Braaihuis sleeps six guests comfortably. 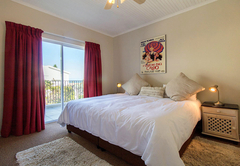 The main bedroom has an en-suite bathroom with a bath and shower. The other two bedrooms each share a bathroom that has both a shower and a bath. 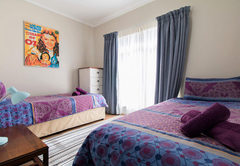 There is also a day bed in the braai room and in the main bedroom which can easily accommodate children. A camp cot can be provided on request. Luxury linens and towels are provided. 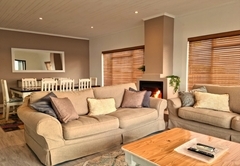 There is an exceptional living area that boasts a big screen TV with full DStv and a fireplace, making this the ultimate spot to relax in the evening. 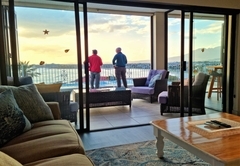 The dining area is spacious and is a great spot to enjoy a meal with your family or friends. 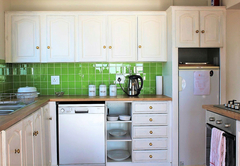 The kitchen comes fully equipped and has every appliance you will require including a kettle, toaster, microwave, stove, two fridges and a freezer. The braai room is also equipped with braai utensils, charcoal and firewood which you can pay for as you use by leaving money on check out. 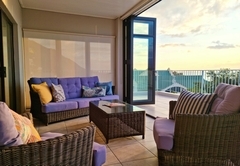 With the large balcony around the house, you have access from all the bedrooms, lounge and braai room and can enjoy dining undercover at the large dining table outside. We have a double parking garage with remote access for your safety convenience. 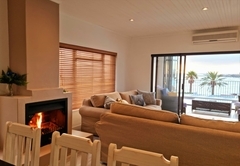 A self catering holiday home includes 3 bedrooms. The main bedroom has an en-suite with shower / bath and toilet. 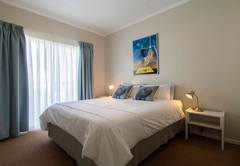 The guest bedrooms have a shared bathroom, also with bath / shower and toilet. All bedrooms are well equipped with luxury linens and towels. A camp cot can be provided if needed. 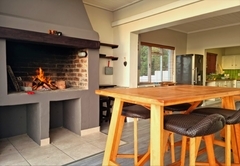 A well fitted kitchen with an indoor braai facility. 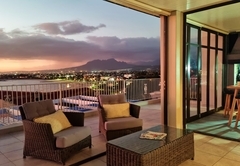 This leads out to a lovely balcony with ample seating and stunning view of Gordon's Bay. A flat-screen TV is also provided. Response timeDie Braaihuis typically responds to requests in 5-10 minutes.